Association. The Board of Directors has established this policy to preserve the safety and security of the residents, to enhance the enjoyment of living in a gated community and to allow for the quick and efficient access for your visitors. Please follow the policy and provide gatehouse staff with the information they need to admit your visitors promptly. If your home is leased or rented, please review this policy with your tenants. 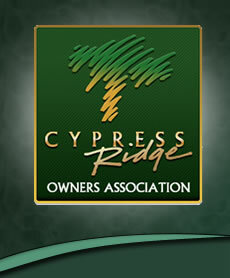 RESIDENTS are all property owners, tenants and/or other persons permanently residing in a housing unit within Cypress Ridge Owners Association (CROA). AUTHORIZED DELIVERY SERVICES are the United States Postal Service, Federal Express, UPS, process servers, retailers, and companies providing regular service for water softeners, bottled water, trash pickup and utilities. VISITORS are any persons visiting a resident of CROA. This includes non‐resident family members, guests, vendors, and service personnel. Examples of service personnel include health care providers, cleaning crews, window washers, and contractors such as plumbers, gardeners, repairmen and painters. For this policy, the terms ''VISITOR" and "GUEST" are used synonymously. c. Approximate length of their stay. If a visitor is staying several days, providing information about the length of stay is especially important so that an extended Guest Pass can be issued. d. An overnight Parking Pass is needed for parking on the street or for three or more vehicles in the driveway. Vehicle make, model and license plate number are also needed. a. A visitor who has prior authorization will be permitted through the gate. If you have not notified the gatehouse in advance of your guest's arrival, the Guard House staff will call you for authorization to admit the visitor. If the Guard House staff cannot reach you, your visitor will be refused entry. b. Each admitted vehicle will be issued a Guest Pass, which is a temporary entry permit that shall be placed face up on the vehicle's dashboard at all times when the vehicle is within CROA. This pass indicates the dates on which entry is authorized. See 2d for overnight parking passes. c. If you are expecting a number of visitors for an event, please provide a list of your visitors to the gatehouse at least 24 hours (preferably 48 hours) prior to the event to allow for faster entry. If you have a regular group that meets at your home you may want to add them to your “Party Guest Pass” list on the GateKey system. a. Permanent Guest Pass for family members, friends who are frequent visitors and others who visit on a scheduled basis like housekeepers and gardeners should be registered on the “GateKey” system. Note: All visitors on a resident's Permanent List will be allowed entry without any notification to the resident, unless you choose to be notified. b. Temporary Guest Pass usually applies to a single service call or a one‐ day visit, but may be issued for an extended period of time for visitors such as contractors. To renew a Temporary Guest Pass, contact the Guard House staff and provide the required information. These names are valid for up to one year. 5. Large Delivery Trucks: If you expect a large truck will be making a delivery to you, please direct the delivery truck to the Main gate entrance and provide the Guard House staff with the appropriate information in advance. All large trucks, trailers and RV’s over 9 feet tall need to use the outside lane at the Guard House to avoid hitting its rain gutter or roof. 6. After Hours Access: To gain access when the Guard House is closed, ask your visitors to use the Door King Telephone System which is located on the inside lane by the right side of the Guard House. Note: This process is to be used only when the Guard House is closed. a. Instruct your visitor to scroll through the residents' names to find your name and then press the “CALL” button. Your phone will ring. When you answer and press "9" for a few seconds, the gate will open. The Door King system also transmits to cell phones if you have your cell phone number entered into the system. Please note: Residents may list more than one phone number in this system. information to the Guard House personnel. In addition, the homeowner shall review the CC&Rs, Rules & Regulations and this Visitor Policy with the tenants. If there are any questions, contact the Guard House at 805‐474‐7781 for clarification. 2. If you are a new resident, complete a "New Resident Data Input" form which is available from the Guard House staff and return it to the Guard House for input into the Guard House “GateKey” resident database. For your frequent visitors, complete the section titled "Permanent Visitor List" and the individuals listed will be added to the Guard House visitor database. The visitor(s) listed on this form will be issued a Guest Pass and permitted entry without the need for additional authorizations in the future. 3. To add guests or remove guests from the Guard House visitor system, contact the Guard House by one of the methods documented in ADMISSION POLICY FOR VISITORS. respectful of others at intersections. Should your visitor be observed speeding or failing to stop at a stop sign, you will be notified and possibly fined. 5. Do not allow your visitors to park their Recreational Vehicles within CROA. Communicate with your visitors about appropriate vehicle parking areas as specified in the CROA Parking Policy. through the gate without a Guest Pass. Doing so is a violation of this policy and may result in a fine. and/or damages common property, that visitor may be denied access in the future and you will be responsible for your guest's behavior, and any damage they may have caused. 1. Realtors that are listing, showing or reviewing homes need to show their credentials and give location of the home that they are going too. Guards will give them a Temporary Pass. If meeting a client at a house, they must give the name of the client to the Guard in order for the client to receive a Temporary pass. 2. Realtors that are holding “Open Houses” need to give the Guard the address and hours of the Open House. will be told to contact a Realtor to get them to show them houses.